Mayor Greg Fischer joined Kris Moon, chief operating officer at James Beard Foundation, at a press conference on July 16 to announce that the Taste America Tour will include Louisville for the first time ever as part of the 6th annual national culinary tour. Other cities include Austin, Boston, Chicago, Los Angeles, New Orleans, Philadelphia, Phoenix, San Francisco, and Seattle.In addition to spotlighting the delicious food around the country, Taste America will focus on amplifying JBF food waste and sustainability initiatives and will directly contribute to the Foundation’s Scholarship programs. The event is already sold out except for $15,000 VIP tables, which you can purchase or ask to be put on the waitlist for $250 dining tickets here. The traveling series will kick off the Louisville itinerary on Friday, October 19 at the 2,250-acre third-generation Ashbourne Farms, 3810 Old Westport Rd. 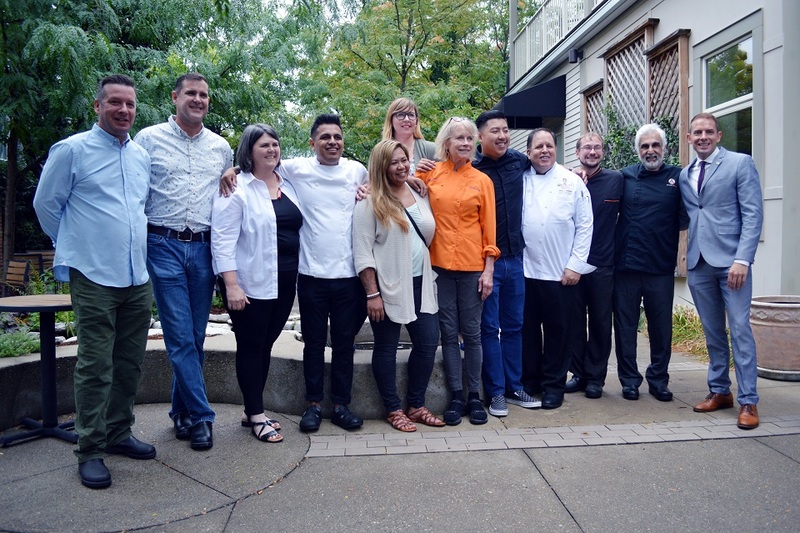 in La Grange, with a collaborative dinner benefiting the James BeardFoundation. The evening will begin with a reception featuring cocktails and hors d’oeuvres from local chefs and restaurateurs, including Anoosh Shariat(Anoosh Bistro), Paco Garcia*** (Con Huevos), Ouita Michel*** (Woodford Reserve Distillery), Ming Pu (502 Bar and Bistro), and Mike Wajda (Proof on Main). Afterwards, guests will be seated for an extraordinary dinner prepared by Taste America Local All-Star Annie Pettry (Decca) and Ahsbourne Farms host chefs Jason Jones and Patrick Roney of Ashbourne Farms and a to-be-announced Taste America Visiting All-Star chef, who will curate a menu showcasing America’s rich and diverse culinary scene. Capping off the night will be a dessert reception featuring Damaris Phillips (Food Network’s The Bobby and Damaris Show), Kathy Cary** (Lilly’s Bistro), Emily Luchetti* (Big Night Restaurant Group, San Francisco), James Adams (Brown Hotel) and Nokee Bucayu (Ashbourne Farms). The James Beard Foundation will donate a portion of the evenings’ proceeds to the Taste America Scholarship Fund. Local culinary students in the 10 participating states were invited to apply for this culinary scholarship between April 1 and May 15, 2018, via jamesbeard.org. Candidates will be reviewed by the JBF Scholarship Selection Committee, and recipients will be announced in August 2018.